Let’s say you’re a Goshen or Monroe driver who needs a spacious hatchback with great mileage and a stunning array of features – in that case, you’ll find what you need in the 2017 Honda Fit. From GPS navigation to heated seats, there’s more than enough here to make the Fit stand out easily from the crowd. Goshen and Monroe drivers already know that the cabin of the 2017 Fit can offer up to a staggering 52.7 cubic feet of storage space, but they’re often surprised by the level of comfort that it can offer into the bargain. Leather-Trimmed Seats: With the EX-L trim level, you’ll enjoy the refinement and comfort of leather-trimmed seats during every journey. Heated Seats: When the temperatures start to drop across Goshen and Monroe, just turn on your available heated seats. There are even two separate heat settings to choose from to allow for total relaxation. Leather-Wrapped Steering Wheel and Shift Knob: After a long day at work, you’ll appreciate putting your hands around the unrivalled softness and suppleness of a leather-trimmed steering wheel and shift knob. 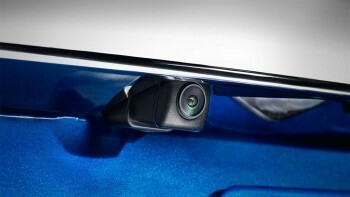 Multi-Angle Rearview Camera: As soon as you shift to reverse, the 2017 Honda Fit’s rearview camera will activate to let you see what’s behind you without having to crane your head. SMS Text Message Function: The Fit doesn’t stop at Bluetooth hands free calls; you’ll also enjoy greater connectivity thanks to the SMS function, which is able to read your incoming text messages aloud. Speed-Sensitive Volume Control (SVC): Hate having your calls or music drowned out by rising engine noise when you have to hit the gas? The SVC system automatically raises and then lowers your sound system’s volume to compensate. Hatchbacks are sometimes sent out into the world bereft of the latest and greatest automotive technologies. The following selection demonstrates that the Fit clearly isn’t one of those models. Lane Departure Warning: Should you begin to move out of your chosen lane without signaling, an alert will be provided. 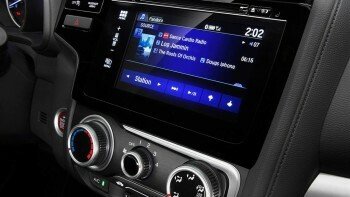 Satellite-Linked Navigation System: Receive turn-by-turn directions to any address in the United States, plus voice recognition technology, Sirius XM, Honda HD Digital Traffic, and HD Radio. Forward Collision Warning: The area ahead of your vehicle will be scanned for obstructions. Should a collision become likely, a warning will let you know in time to step in and prevent the worst from happening. Whether you’re looking for an easier time reversing into tight parking spaces or a luxurious cabin, the 2017 Honda Fit is able to deliver. To find out more, just contact one of the team here at Middletown Honda today.